Posted on February 5, 2012	by S.
My good and great friend Jackie’s grandmother, the inimitable Mrs. Edwards, died last week. Jackie and I were both our grandmother’s girls, and I don’t know where either of us would be without those beloved women. I swiped this picture from Jackie’s Facebook. I hope she doesn’t mind. 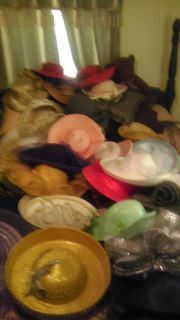 Those are Mrs. Edwards’ hats, and they describe exactly the lady she was.